A fun class 3+ run in Chile´s South Central Andes. Flowing off the North Western Flank of the imposing Sierra Velluda (2448 meters), the Rio Rucue is a mellow springtime creek run. Crystal-clear, cold water and an undisturbed streambed make for a pleasant float thru native forests in Chile´s 8th region. To reach the river go east from Los Angeles for 66 km to town of Antuco. In town turn right at a supermercado on Calle Santiago Aldea. Follow it for a few blocks until it dead ends in La Peña. Go right until another T intersection with Almagro and go left. Follow this road up and then down a step grade for 7.1 km and you will cross a small creek. Continue another 2.3 km and you will come to the Rucue river and takeout point. GPS coordinates 37.388819°, 71.676521°elevation 580 meters. Continue upstream to the put in just before the locked gate of fundo Las Mellizas at 680 meters elevation.. 37.403319 latitude, 71.646819 longitude. 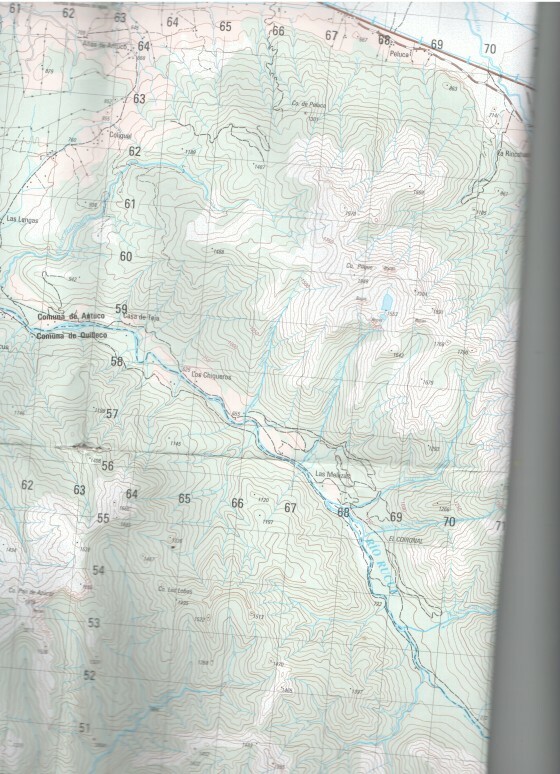 If you can get through the gate, or are willing to walk there are another 8 km of unexplored kilometros from starting point of 900 meters elevation. The 3.5 km stretch I did averages 28.5 m/km or 140 FPM. 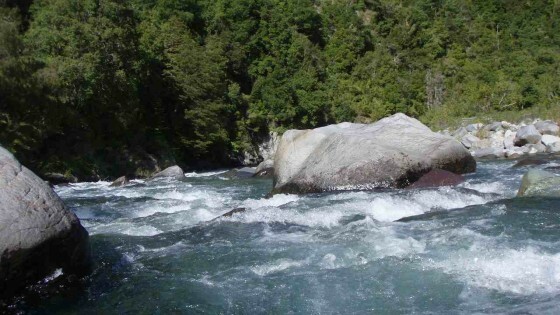 When I ran river on November 27, 2011 the flow was around 350 CFS which is for sure a minimal flow. Best to run river in September and early October. Higher flows will present class 4 rapids. Note: After running the river I learned there is a swinging bridge with easy road access 2 km downstream. An earlier turn (on the road from Antuco) onto a dirt road leads 800 meters to the swinging bridge. This road can be identified by a sign saying Camping Los Mañios. One might consider boating further downstream but it is not advised as 5 km downstream half the water is diverted into a canal and another 5 km beyond that almost all of the remaining juice is diverted into another canal.